Actor Timothy Hughes snatched a 'Re-elect Trump 2020' flag from the hands of an audience member by an actor performing in the "Frozen the Broadway Musical" Wednesday. He speaks to Adam Kuperstein. 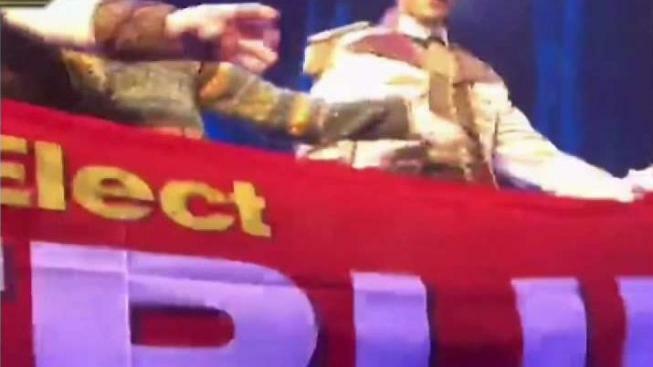 A 'Trump 2020' flag was snatched from the hands of an audience member by an actor performing in the "Frozen the Broadway Musical" Wednesday. The actors were doing their bows during the encore at the St. James Theatre when the audience member in the front row starting waving the flag. Seeing it, actor Timothy Hughes -- who plays Pabbie the wise troll in the musical -- snatched it and threw it behind the stage. "I happen to look out of the corner of my eye, and I see this guy run up and he has the flag," Hughes told News 4 New York on Thursday. "I think that sign of disrespect has no place at our show and in our theater, and I felt the need to respond in that moment." In an Instagram post on the incident, Hughes said he was unapologetic. "What does it say about our country and politics when a man at the show tonight felt the need to protest Disney’s Frozen on Broadway with a pro Trump flag?" he said. "How frightening is it that our show’s messages of love, acceptance, and diversity have become the opposition to supporting Trump?" Hughes added that the curtain call was supposed to be a final connection between audience and actors, and he wouldn't have his cast be interrupted. "I will not apologize for how I responded to the disrespectful man trying to interrupt this moment with a pathetic political platform. Not at our show!" Showgoer Crystal Sotomayor recorded the video of Hughes snatching the flag from the man, who was wearing a "Make America Great Again" visor. "We were ecstatic that [Hughes] took the flag, it needed to happen. That was ridiculous," she said. Sotomayor said "the guy starts pointing at his visor, then told cast members he needed $5 for his flag. I was like, 'He's insane.'" It's not the first time Broadway and politics intersected. Just after the 2016 election, the cast of "Hamilton" singled out Vice President-elect Mike Pence in the audience and addressed him with a prepared message. President-elect Trump called it harassment. Asked if he would have reacted the same way if the flag bore a message or name aligning with his own politics, Hughes said, "I think my personal opinions are that I am anti-President Trump 2020, but my instinct and reaction was first out of disrespect to myself and the company." The Trump supporter was not removed from the theater, but the incident happened at the very end of the show. "Frozen the Broadway Musical" is a show adapted from the blockbuster Disney film. It follows Anna, mountaineer Kristoff and his reindeer sidekick to find Anna's sister, Snow Queen Elsa, and break her icy spell. "Frozen the Musical" director Michael Grandage has been contacted for comment.